Description: One of the central characteristics of the latest historical Jesus research has been the attempt to locate Jesus plausibly within first-century Judaism. Less emphasis has been placed on the question as to whether or how, if at all, the image of Jesus within the Jewish context also suits and accounts for the history of the influence and reception of Jesus in early Christianity. Tom Holm�n urges that the Christian reception history of Jesus be given a proper role in research. He argues that the scrutiny of the reception should not be a mere appendage to the more careful study of Jesus within Judaism. Instead, the reception should be given equally serious attention and form an integral part of scholarly pursuits. As a result, one no longer studies Jesus �within Judaism� but �in continuum,� namely in the continuum from early Judaism to early Christianity. 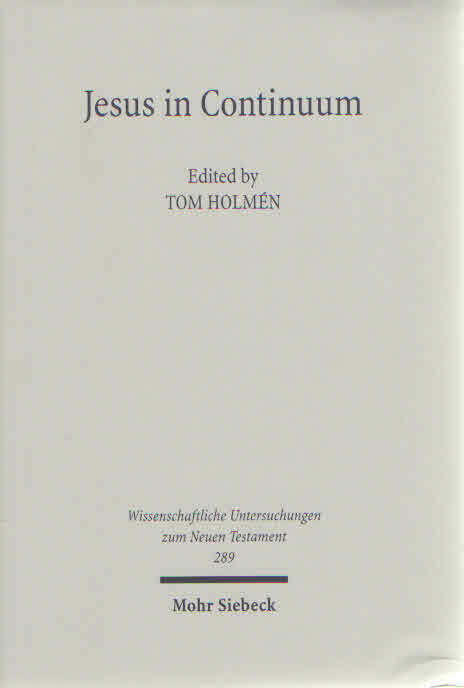 The articles of this volume outline a continuum approach to the historical Jesus. They are divided into three areas exhibiting different aspects of the continuum approach: theoretical aspects, Jesus meets Christianity, and Jesus from Judaism to Christianity. Citation: Sarah E. Rollens, review of Tom Holm�n, ed., Jesus in Continuum, Review of Biblical Literature [http://www.bookreviews.org] (2014).